Want to stay up to date on the latest happenings here in Michigan, the US, and around the world? Sign-Up for the ISM Newsletter today! What an active month we have coming up now that winter has slipped its way out of metro Detroit! unset along the Detroit River is almost always beautiful, especially when autumn begins to arrive. April in Michigan is always surprising: summer temperatures one day, and a snowstorm the next! We all delight in a new year, don’t we? So much to look forward to, so many possibilities! 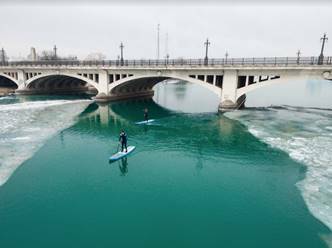 Even in the worst winter conditions, the people of Detroit find ways to enjoy our beautiful river! There are several exciting opportunities for entrepreneurs and college students in and around Detroit this month! Happy Holidays for those who celebrate something in December - and Happy New Year to All!